Stepfamilies can be wonderful blendings, but it may take a while for the individuals to mesh well. In the beginning, many members of stepfamilies feel as though they are two separate groups living together, rather than a single family unit. When people with children marry, they may assume that the kids will naturally gravitate toward one another and feel like siblings in no time at all. In reality, though, most kids take a while to feel truly connected to their step-siblings, but if their parents create home environments that are conducive to openness and sharing, the children will likely grow close to one another. Parents and stepparents need to be aware of their children’s feelings and take steps to see that each child gets the time and attention that they need. Some kids do best when left to their own devices while others may require a little nudge now and then, but when children feel that they are valued and appreciated, they will blossom not only as individuals, but also as part of a unified family group. In all likelihood, the blending of stepfamilies requires some lifestyle changes for all members. 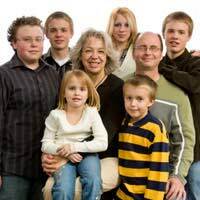 The children of each individual parent came into the blended family having been accustomed to a certain set of house rules and expectations, but when the two groups become one, they must learn to live together, which requires some level of compromise for everyone. The most important factors for making everyone feel that they matter is for parents and stepparents to ask for each child’s opinions, and then take those suggestions into consideration when implementing new rules. House rules need to apply to all of the children in the home, and each child should anticipate the same rewards and disciplinary measures, should they fail to comply with their parents’ expectations. Most kids aren’t fond of rules, but they will accept them most readily when they feel that they have been well thought out and applied to all family members equally. Families tend to participate in a wide variety of activities, depending on the ages and individual interests of their children. Additionally, many families have well established habits regarding the things that they find entertaining – some enjoy bike riding while others prefer to visit museums – but when the group unites, they need to invite their new members to join them as they pursue their hobbies. Ideally, each family member is given the opportunity to introduce the others to the things that they enjoy so that everyone not only learns about one another, but develops shared interests. Parents and stepparents can promote family unity by scheduling activities that they know the children will enjoy, being sure to see that each child’s interests are represented a fair amount of the time. Given the opportunity, most children will grow to love their stepparents and step-siblings, but in order for them to be happy in their families, kids need to know that they are valued both for their individuality and for their contribution to the family as a whole.